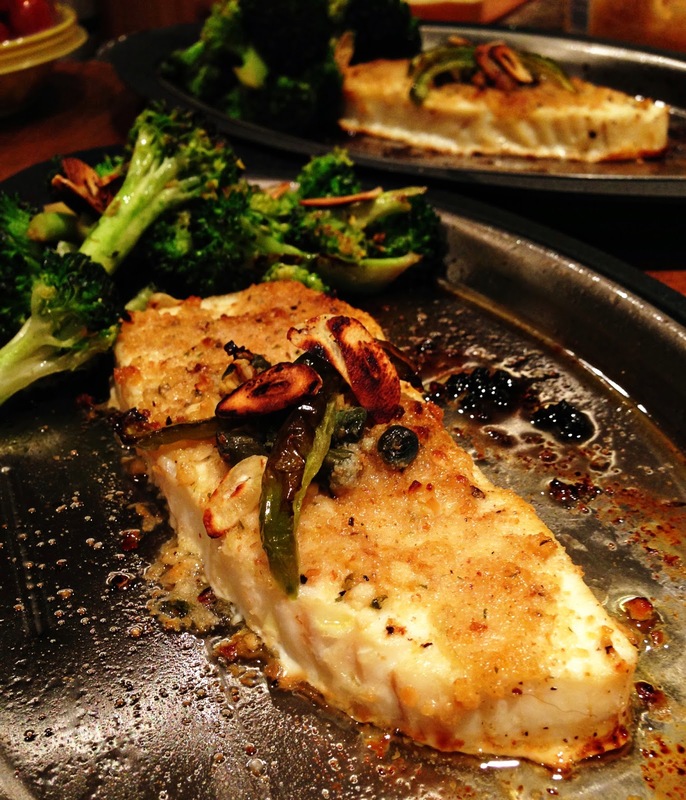 So the other day when I shared the Italian Broccoli recipe with you, I mentioned "the fish." Well today, you get the recipe for "the fish." I went to a birthday party last night for a precious 13-year-old and spent hours taking in all of the loved ones that shared those great memories with me at Patsy's. Every single person in that room would use their best Italian accent and tell you what Patsy thought of eating meats other than fish. ::in my Italian grandpa accent:: "You, you eata da fish...the chicken, it hasa da hormone, da hormone make the chicken fat, you eat the chicken, you getta fat like the chicken...the fish, you gettin da fish" (be glad you can't hear me...my impression is terrible). I actually went in on a double date and rather than walking into the kitchen and just letting him know I was there to eat and waiting to see what he brought me, I ordered via the waitress, off the menu. She must have tattled on me because not long after she walked off, here he came....and I got scolded. I ordered pasta with Italian sausage and marinara. He said "Who order the sausage? What's a matta with you?" Can I give you one guess as to what I ended up with? The fish.... and I loved every bite. This dish holds an insane amount of memories and I am more than excited to share it with you. He may not be blood, but he is family, so consider this a recipe passed down. 2 halibut fillets (Skinless) - you can use any mild white fish: sea bass, talapia, orange roughy, etc. 4 slices red or green bell pepper. Lightly salt and pepper both sides of the fillet. Coat top of fillet with breadcrumbs. 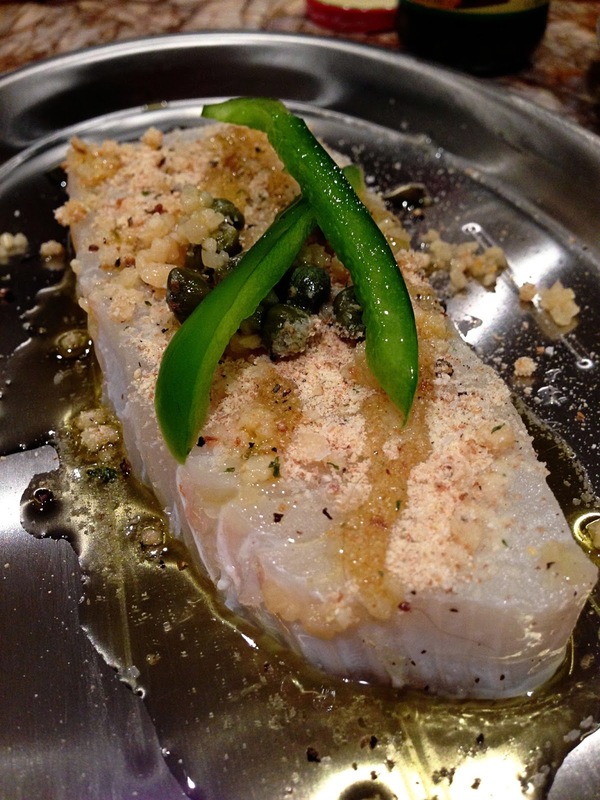 Pile the garlic and capers in the middle area on top of the fillets. Top with pepper slices. Zest some lemon rind and drizzle lemon juice over the fillets. Turn your ovens broiler on. Drizzle some olive oil in an oven-safe skillet. Heat it on the stove-top over medium/high heat. When the oil is hot, place the fillets in the skillet to sear the bottom, drizzle olive oil over the fish. Place in the oven for 6-8 minutes to finish cooking the fish. Cooking time may vary depending on the thickness of the fillet. The internal temperature should reach a minimum 130 to 135 degrees. Serve with Italian Broccoli or Stewed Okra (both Patsy inspired side-dishes). **If you don't have an oven-safe skillet, you can place them on a baking sheet and just broil them, you just won't get the sear on the bottom but it is still perfectly delicious! This recipe looks so good, Krystal! I'm always so afraid to cook fish for some reason, it's usually my treat whenever we go out to restaurants. I don't know why I'm so afraid to cook it, this recipe looks fool proof and delish! I used to be the same way! Most people OVER cook fish because they are afraid it isn't done. Get an instant read digital thermometer (anywhere from $15-$30) to make sure it is around 135 degrees and your good! Give it a try, I make this and the broccoli in 20 minutes flat start to finish! This was delicious! My family loved it.